Acts of artistic expression and cultural celebration abounded on March 9 at Sanders Theatre, where the Harvard Foundation for Intercultural and Race Relations’ 34th Cultural Rhythms Program honored Janet Mock as its 2019 Artist of the Year. Over the course of the show, 12 student groups delivered unique performances in media ranging from traditional Ethiopian dance to acapella to Tae Kwon Do. In her speech, Mock praised the performers and the ethos of Cultural Rhythms as a whole. “To write, record, create, sing, dance, seek, and show ourselves in a world intent on erasing and invisibilizing, shunning and shaming, is a necessary and vital act,” she said. Mock, an award-winning writer and activist, broke ground this year as the first transgender woman of color to write and direct an episode of television for “Pose,” a drama about ball culture in late ‘80s New York City that also included a record-high five transgender women of color in series regular roles. On Saturday, Mock held court over the proceedings from a chair onstage. She frequently pulled out her phone to capture moments from the performances and posted multiple Boomerangs to her Instagram account throughout the afternoon. Afterward, student performers emphasized an appreciation for the opportunity that the Cultural Rhythms show affords them to share their cultural art forms with the larger Harvard community. This year’s theme was “Reclamation,” and the radical act of reclaiming space on Harvard’s campus — both to honor the college’s richness of cultural identities and to empower individuals who have been and continue to be marginalized from rarified, historically exclusionary spaces — recurred as a motif throughout the afternoon. Mock discussed the power and responsibility that comes from occupying these spaces in her address to the audience after formally receiving the Artist of the Year award from Dean of the College Rakesh Khurana. “It’s only March, but so far [Janet Mock coming to Harvard] is the best thing that's happened to me all year,” Omise’eke Tinsley, the F.O. Matthiessen Visiting Professor of Gender and Sexuality Studies at the College, said. Tinsley brought her young daughter to the show. 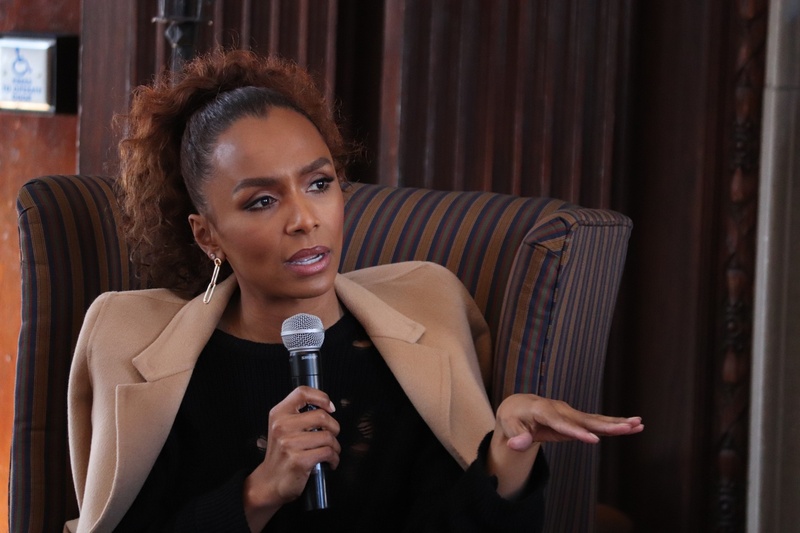 “There’s a lot of excitement in my classes around Janet Mock, and queer students feeling heard and feeling like it's important to have reflected to them that there are queer folk who are doing amazing work and that Harvard recognizes that,” Tinsley said. The Cultural Rhythms celebration show heralded a month’s worth of programming and campus conversations organized by the Harvard Foundation. The show served as both a conclusion and a reflection. Mock’s speech was the centerpiece of the show, and her words roused the crowd into a standing ovation. She recounted her difficult childhood in Hawaii, where she said, “my library card gave me, this 12-year-old kid, and this lover of books, access to words, written by Maya Angelou and Alice Walker and Zora Neale Hurston.” Now a New York Times bestselling author, Mock herself has the chance to serve as a refuge for other young folks. “We are worthy of being read, we are worthy of being heard, we are worthy of being seen. we deserve to take up space, on library and bookstore shelves, on syllabi, on gallery and museum walls, on the screen,” she said. But Mock urged against complacency. “Being the first is cute and all, but the real work comes when we ensure that we hold those doors open so that we're no longer the only or the last, right?” she said. The audience — now filled with performers who had come from the wings to hear Janet Mock speak — snapped, whistled, and cheered. —Staff writer Amelia F. Roth-Dishy can be reached at amelia.roth-dishy@thecrimson.com.